ONTARIO (BP) — Seventy-five years ago, Southern Baptists’ seminary in the West was born during a prayer meeting, the dream of a visionary man. Gateway Seminary (formerly Golden Gate Baptist Theological Seminary) celebrated that anniversary March 14 during a Founder’s Day event that culminated in a 10-hour prayer vigil by faculty, staff and students. “Isn’t it appropriate that we begin our celebration with prayer, just as the school began?” President Jeff Iorg asked the audience gathered in the chapel. He said the seminary was the dream of a man from Arkansas named Isam Hodges. Hodges, his wife and five children moved to Berkeley in 1935, one year before the first Southern Baptist church was founded in the state. He graduated with a master of arts degree from Berkeley Baptist Divinity School in May 1937 and accepted the call to serve as pastor of Golden Gate Baptist Church the next month. The church cooperated with the Northern Baptist Convention. Iorg said Hodges’ frustration with the slow response did not keep him from opening his heart to his own people. His sermons were filled with Baptist history and missionary information. He challenged the church with descriptions of sacrifice by those who had spread the gospel in other areas. He sought in every way he could to spur their evangelistic concern. “As Southern Baptist churches began to be organized nearby, Hodges and his people became aware of their work and growth,” Iorg noted. “He suggested to his Northern Baptist brethren this was the kind of work they should be doing. On Nov. 17, 1943, Golden Gate Baptist Church voted 36 to 6 to begin partnering with the Southern Baptist Convention. Hodges had been their pastor for more than six years. Although he hadn’t joined that fellowship to turn it toward Southern Baptist alignment, the six years of evangelistic and missionary promotion made a difference in the life of the congregation. As Hodges looked about him in early 1944, he knew only a great network of churches in every city, town and village could accomplish what God would do in the West, Iorg said. New missions and churches had to be started, and many more pastors and other church leaders would need to be trained. Hodges prayed more about his lifelong dream and willingness to work toward creating the school he felt was needed. Hodges knew it was time to begin the school he had envisioned before moving to California. Hodges was not a trained educator, but God was placing on him the responsibility to begin a school. One of his friends, though, did have more school experience and theological training — Dallas Faulkner, pastor of First Baptist Church in San Francisco. Like Hodges, Faulkner was a native of Arkansas and a graduate of Ouachita Baptist College and Southwestern Seminary. He had continued his studies and earned a doctor of theology degree from Southern Seminary. He came to California in the 1930s, first settling in the Bakersfield area, before ultimately moving to San Francisco. Because of his background, Hodges decided to enlist his friend’s help. The two talked, prayed, planned and took definite steps to organize Golden Gate Baptist Theological Seminary. On March 26, 1944, during morning worship at Golden Gate Baptist Church, Hodges asked that the six deacons be recognized as a committee from the church to meet with a like committee from First Baptist in San Francisco to begin establishing a seminary. 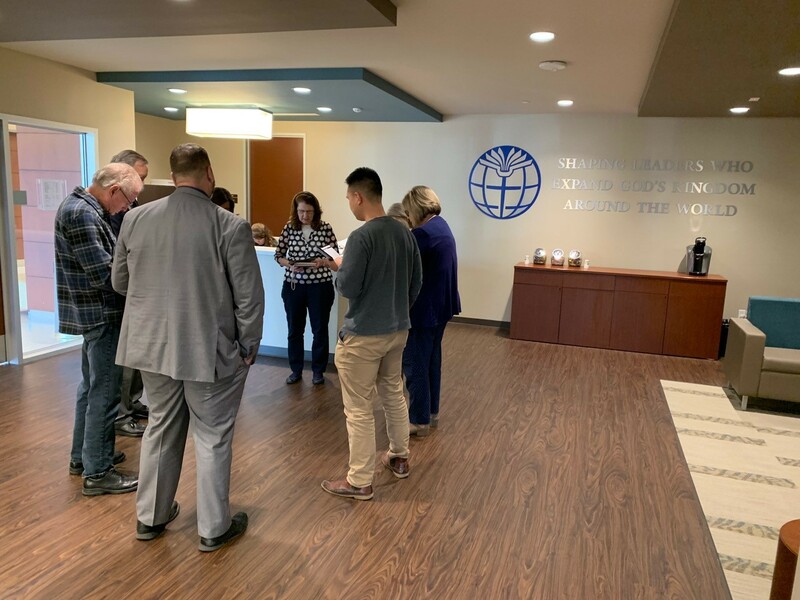 The church unanimously adopted the recommendation, and those deacons, along with Hodges, met with the committee from the San Francisco church on March 31, where the vote was taken to legally organize Golden Gate Baptist Theological Seminary. “A charter from the state was applied for on July 12, 1944 and obtained, bearing the date July 24, 1944,” Iorg noted. The seminary maintained the name through locations in Berkeley and Mill Valley until 2016, when the institution moved to Ontario and the name was changed to Gateway Seminary. The institution offers degrees on four regional campuses, in addition to all master’s degrees being offered online. “This is the story of our founding,” Iorg said. “A visionary pastor, a friend who partnered with him, and 12 Baptist laymen put their lives on the line to create what has become one of the largest seminaries in the world — a beacon of biblical scholarship with missional intentionality shaping leaders who expand God’s Kingdom globally. A prayer journey began immediately after the service, with participants engaging in one-hour sessions as they moved through the six-story Ontario building. In addition to the birthday party in July marking the issuance of the seminary’s charter, other celebrations will be held during fall and spring trustee meetings. The 75th anniversary celebration will conclude in April 2020.